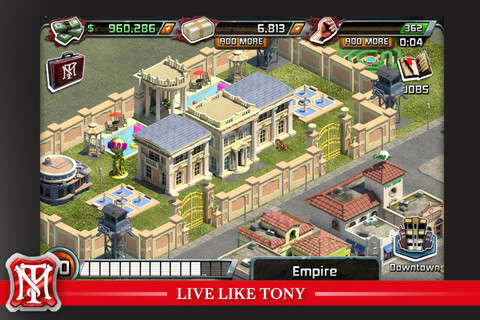 Tony Montana hits rock-bottom in this iOS outing. Brian de Palma's classic 1983 movie Scarface might just be one of the most misunderstood films in the history of Hollywood. Admired by gangsters without a trace of irony, the film's bleak message of self-destruction through criminal ambition is often over-looked in favor of its classic dialogue and endlessly tense scenes. 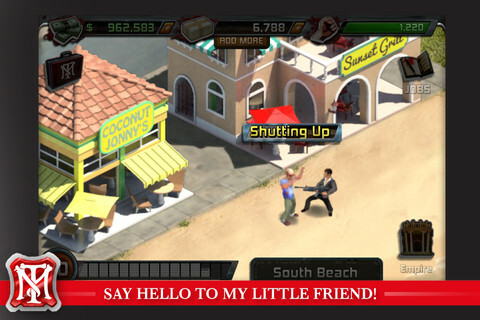 Part empire-building sim and part mission-based point-and-click adventure, Scarface for iOS uses famous images from the film to tell Montana's story as he progresses from short-order cook to the king of cocaine. Tap a character marked with an arrow and Tony will teleport within walking distance, stagger over with a jagged animation, and then interact with the person. That interaction amounts to a bar appearing that might read "beating" or "shooting" as it gradually fills up. There's no requirement to do anything else except watch, collect the money and XP tokens that land on the screen, and then rinse and repeat the activity across the rest of the game. That's it for the action side of things. In the empire-building section, you'll create new buildings, expand your land ownership, and improve your mansion and personal defenses. At the start of the game, Manny Ribera will pop up to suggest you buy a gift shop, for example. Over time, these buildings will pay for themselves with a cash profit that's used to advance through the game and expand your empire. More often than not it'll be you saying this. Every time you complete an act of "significance" in the game, a low-fidelity audio recording of one of Montana's classic lines is played. Collect money if you want to be informed of how exactly Tony is prepared to bust his balls. "Every dog has his day!" we're told, as Tony threatens a woman on the beach for no particular reason. Taken out of context to suit the wafer-thin gameplay, the lines from the film lose every ounce of their power. That each piece of dialogue is used so repetitively only pours salt into the wound. "Well done Tony," exclaims Manny once you've grasped the fundamentals of the game. "You've got everything it takes to make the world yours!" As with so many other moments in the game, it's often hard to tell whether the game is being played with a straight face, or simply offered up as parody. The game pays very poor tribute to the film. None of the paper-thin gameplay and butchering of the outstanding film would be nearly so offensive if Scarface didn't feature one of the most egregious in-app purchase systems the App Store has ever seen. 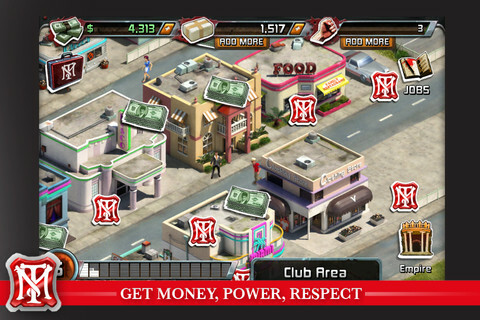 In-game money and 'power' is necessary to make progress through the game and these regenerate incredibly slowly. 'Product' (read: cocaine) can be used to speed up construction processes and is also available for purchase. Everything in the game is positioned to send you to that store, from a mission rewarding $60 that can't even be completed without spending several hundred more, to speeding up construction plans that stretch off agonizingly far into the future. Given the butchering of the characters, the audio, the gameplay, and this constant requirement to invest money, it's hard to imagine what devoted fans of the film (the presumed audience) are supposed to make of all this. In-app purchases dominate any reasonable attempt at gameplay. 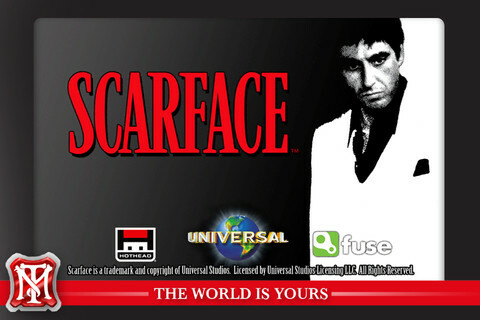 In tribute, execution, design and characterization, Scarface is nothing less than a dreadful game: a mindless Skinner box that doesn't even offer up enough temptation to make you want to take another peck at it. The score it achieves reflects only that the game does what it does without breaking itself in the process. What's Hot: Functionally, the game isn't broken. What's Not: Weak empire-building, low-quality sound, egregious in-app purchase system, and a poor tribute to a classic film.